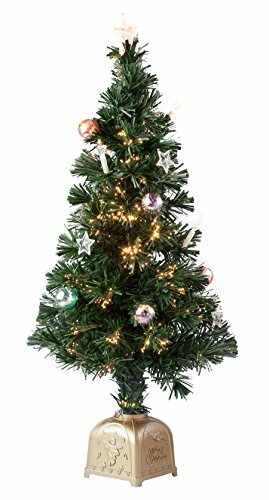 Prelit, pretrimmed fiber optic spinning musical Christmas tree glows in continuously changing colors, spins a full 360 and serenades you with a medley of carols (just plug it in and call it Christmas). The lush, evergreen branches on this fiber optic tree sparkle with longlasting fiber optic tubes that change from reds and yellows to blues, greens and purples. Making the magic even easier, this doitall small fiber optic Christmas tree arrives with 18 permanently attached ornaments in place (a festive variety of traditional round balls, stars and candles). Switch the music on and enjoy automatically changing snippets of 25 classic holiday tunes. Revolving goldtone base lets you enjoy the beauty from every angle. Easy assembly; includes UL listed adapter. Plastic, wire. Tree: 36" high. Stand: 5 1/4" sq.